For SCOTCH WHISKY 2016 was, to use a worn footballing cliché, a game of two halves, writes Leon Kuebler for WhiskyInvestDirect. Overall, as first reported by WhiskyInvestDirect, Scotch whisky produced its best export performance since 2013. But after six months, the value of Scotch exports shipments was actually down on the previous year. This came in spite of the fact that, compared to 2015, more litres of Scotch were dispatched overseas in the same period. At the time, we noted two reasons for this drop in value. In the short term, there was a large decline in the Sterling value of shipments to Latin America and the Caribbean, the fourth-largest region by value for Scotch, in Q2 2016. Ignoring Latin America, exports of Scotch whisky were worth the same amount in H1 of 2015 (£1.549bn) and 2016 (£1.550bn). Seen over a longer perspective, however, there was a second, more fundamental reason. Since 2012, the value of Scotch whisky exports has been negatively affected by the strong Pound, which made UK-manufactured products such as Scotch more expensive to buy in foreign countries. In Sterling terms, the total value of Scotch whisky exports was 10% lower in 2015 compared to 2012. Yet the Pound was effectively 10% stronger in 2015 compared to three years earlier. This meant that the amount of foreign currency spent on Scotch in 2015 was almost equal to Scotch's peak in 2012. This changed after the June 23rd referendum vote to leave the European Union, when the Pound dropped sharply in value. The declining value of Sterling has continued throughout 2016. According to the Bank of England's Broad Effective exchange rate index (ERI), which measures the strength of the Pound against a basket of other foreign currencies, Sterling was weaker by the end of 2016 than in any quarter since Q1 1995. This has positively impacted the value of Scotch exports. Indeed, when adjusted for foreign currency, the 2016 performance of Scotch whisky exports is striking. All in all, the amount of foreign currency spent on Scotch in 2016 was down 7.4% compared to 2015. This was the lowest amount of foreign currency spent since 2011. If volumes were going down and only the weakness of the Pound was causing value to rise, this might cause alarm, as it could suggest that Scotch was becoming less popular worldwide. But the quantity of Scotch exported actually rose by 4.1% on 2015 – the fastest rate of growth Scotch has posted since 2011. And compared to 2016, there have only ever been two years that saw more Scotch dispatched: 2011 and 2013. 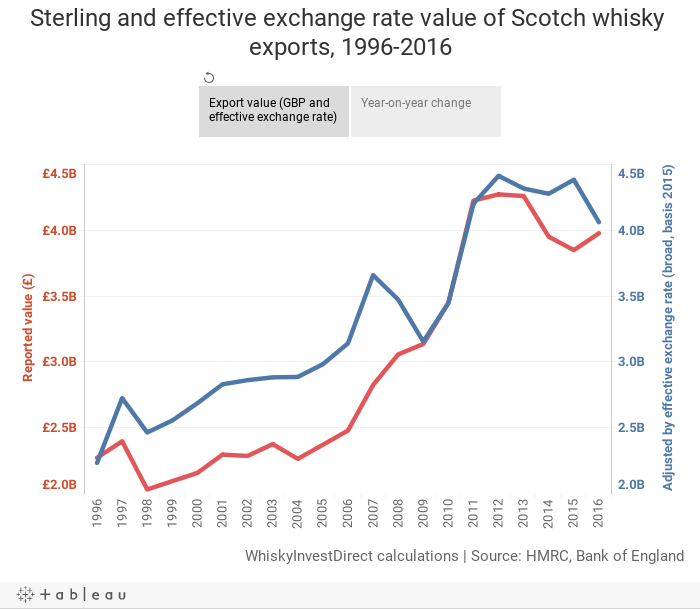 So three factors are happening simultaneously: rising volumes of Scotch exported, with an increasing Pound value, despite less foreign currency actually being spent on these products. The last time these three factors transpired together was in 2009. Double-digit value growth occured in each of the two years which came after. The signs are that the weak Pound is not masking declining demand for Scotch, but actually doing the opposite: making Scotch more affordable at a time of growing global popularity. Which brings us back to Latin America. Although figures for Latin American imports of Scotch have historically proven volatile, they have largely followed the global pattern this decade. So the Sterling value of Scotch exports to Latin America peaked in 2012, while the amount of Scotch shipped reached its high point in 2011 – the same trend shown worldwide. After 2012, the value of Latin American Scotch whisky imports dropped in every year. And it appeared that this would continue in 2016, as H1 exports of Scotch whisky to Latin America were down 11.4% in value on 2015. Yet the second half of 2016 produced wildly different results. In the last six months of 2016, the value of Scotch exported to Latin America increased by 15.2%. This meant that, for the year of 2016 as a whole, exports actually rose by 2.0%. This dramatic change was not linked to fluctuations in demand. After all, volumes rose 4.5% year-on-year in H1 and 6.5% year-on-year in H2. Nor was Scotch's turnaround in Latin America dependent on one large market. Over the course of 2016, the value of exports to Brazil, the largest market for Scotch in the region, actually declined by 1.9% on 2015. The situation in Venezuela, which was the region's largest market in 2012 before its ongoing economic crisis began, was even starker. Only £10.9m worth of Scotch arrived in Venezuela last year – barely a tenth of the £102.3m worth of Scotch which they imported four years earlier. Ignoring Brazil and Venezuela, however, Scotch has been quietly growing in Latin America and the Caribbean over the last two years. Year-on-year, value increased by 3.6% in 2015 and 2.7% in 2016; export volumes rose even faster, at 2.7% and 12.4% respectively. This growth depends overwhelmingly on blended whisky. Single malt, while increasingly popular in these countries, is still of very limited significance, accounting for only 2.8% of the 2016's overall value of exports to these countries, and a mere 0.9% of the total amount of liquid imported. Latin America has the kind of economic profile which Scotch, a luxury product, requires. Of the 42 countries in the Latin America and Caribbean region, 16 are currently classified as 'High Income' by the World Bank. Another 20 countries come under 'Upper Middle Income', which includes Brazil and Venezuela. After a difficult period, the region looks poised for economic recovery. While Latin America's GDP contracted in 2016, this was largely due to the recessions in Brazil and Venezuela. The IMF has projected growth of 1.2% for the region in 2017, but important emerging markets for Scotch, such as Chile and Peru, are expected to perform better. And while poverty and inequality remains a problem, the long-term trend indicates the emergence of a growing middle class, even if, as the World Bank noted, the economic problems of the last couple of years have slowed this somewhat. The future of Scotch is certainly not dependent on Latin America, which remains a distant fourth place in the regional standings for Scotch. But if exports are to continue to increase steadily in a broad range of markets, it will need to do so in countries like those found in Latin America – upper middle-to-high income emerging markets, with a steadily growing middle-class that has a rising interest in whisky. Should the Pound remain so weak, whisky should become more affordable than in at any point in recent memory in many countries like these, so long as domestic economic conditions remain equal or better. Of course, such a scenario may not come to pass. But if it does, while single malts may become more popular, it will be blends that prove the main beneficiary.